"Prosperity is just around the corner". The family finds Bart writing "I will not bring the chalkboard home" on a chalkboard in front of the couch. "MyPods and Boomsticks" is the seventh episode of the twentieth season of The Simpsons. It first aired on the Fox network in the United States on November 30, 2008. In the episode, Homer becomes suspicious of Bart's new Muslim friend, Bashir, and decides to invite his family for dinner. When Homer offends them, he goes to their home to apologize but discovers what he believes to be a terrorist plot to blow up the Springfield Mall. In the episode's subplot, Lisa gets a MyPod (a parody of iPod) and racks up a large bill. At the Mapple Store, Bart interrupts a video message from company founder Steve Mobbs and insults the company's user base. Fleeing from the Mapple customers, he runs into a Muslim boy from Jordan named Bashir and befriends him. Homer is impressed by Bashir's manners, but Lenny, Carl and Moe convince him that all Muslims are terrorists. He invites Bashir's family over to dinner in an attempt to expose them, but openly offends them, causing them to leave. Later that evening, while going to their home to apologize, Homer catches a glimpse of Bashir's father working with TNT in his garage. He goes home and has a nightmare featuring the Genie of Aladdin, who transforms the "decadent, Western society" into a stereotypical Islamic republic. Shaken by the dream, Homer eavesdrops on Bashir's father speaking about his work in building demolition, but misinterprets it and believes he is a suicide bomber. As soon as Bashir's father departs for work, Homer convinces the mother to invite him so he can apologize. He hacks into the family's laptop and discovers a diagram of demolition plans for the Springfield Mall. Homer rushes to the mall to warn the shoppers and sees Bart standing near a detonator with Bashir and his father; he attempts to save the day by throwing the dynamite in the river. It actually turns out that the old mall was slated for destruction. Realizing his mistake, Homer apologizes, and the Simpson family throws a "Pardon My Intolerance" party for Bashir's family. In a subplot, Lisa obtains a MyPod from Krusty the Clown at the Mapple Store. She becomes obsessed with the device and racks up a US$1,200 bill. She goes to Mapple's undersea headquarters and begs Steve Mobbs to consider a reduced payment plan. Mobbs offers Lisa a job at Mapple to help with her bill. Much to her chagrin, the job is standing on a street corner dressed as a MyPod, handing out Mapple pamphlets and telling people to "Think Differently". The episode features numerous parodies of Apple Inc. and its products. Apple is portrayed as Mapple, with the MyPod, MyPhone, MyTunes, MyCube, Mapple Store and Brainiac Bar referring respectively to the iPod, iPhone, iTunes, Power Mac G4 Cube, Apple Store and Genius Bar. Later episodes of the show also feature a MyPad, a reference to the iPad. 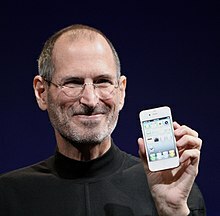 The CEO of Mapple is Steve Mobbs, a parody of Apple Inc.'s then-CEO Steve Jobs. The scene where Comic Book Guy throws a sledge hammer at the screen is a reference to the "1984" Apple commercial. The scene where Homer is on a flying carpet is a parody of the film Aladdin; the Genie also makes an appearance. The Simpsons regular Dan Castellaneta does the voice of the Genie in this episode. He had previously voiced the Genie in the Aladdin television series, The Return of Jafar, and the Kingdom Hearts video game series. Steve Mobbs operating a series of holographic screens with his hands is a reference to the 2002 film Minority Report. The episode features Minnie Riperton's song "Lovin' You" and Miles Davis' "Moon Dreams", while the episode's Itchy & Scratchy cartoon features Ludwig van Beethoven's "Symphony No. 5" and the Alicia Bridges song "I Love the Nightlife". "MyPods and Boomsticks" was the most viewed show on Fox the night it was first broadcast, with roughly 7.8 million viewers and a 4.4 Neilsen rating. The episode was generally praised by critics. Robert Canning of IGN praised the episode; as a whole, he called the episode funny and strong and "gave the now familiar 'suspected terrorist' plot a Simpsons twist," but called the remainder of the Mapple storyline less impressive. Canning ends his review by saying that minus Lisa's involvement after act one, it was a decently funny episode of The Simpsons. He gave the episode a rating of 7.6/10. Writing for The A.V. Club, Steve Heisler gave the episode a C-. He found the themes of Apple and Islamophobia to be dated, and was perplexed why all names relating to Apple were slightly changed but not references to other brands. Daniel Aughey of TV Guide also praised the episode for its jokes but lack of flow, calling it "one step behind". Entertainment Weekly's Five Best TV quotes of the week includes Bart's line of "Wow, all these years I've been patting lambs when I should have been shoving them in my mouth." The Simpsons is noted for its religious themes, primarily the Protestant faith of most characters, but has also featured episodes based around Judaism, Catholicism, Hinduism and Buddhism. However, this was the first to have a plot involving Islam. Religion writer Mark I. Pinsky contacted the show's staff while writing The Gospel According to The Simpsons in 2000 to inquire why. He was told that this was because they did not know enough about the faith, but were intending to make an episode. In a June 2015 article for CNN after several controversies regarding depictions of Muhammad, Pinsky noted "MyPods and Boomsticks" as a satire of Islam that is "wise, and well within the show's tradition of portraying an unfamiliar faith in a knowing way, with a relatively light hand, while at the same time defanging a widespread religious prejudice". Religion author David Feltmate mentioned the episode in his book Drawn to the Gods: Religion in The Simpsons, South Park and Family Guy, alongside the South Park episode "The Snuke" and the Family Guy episode "Turban Cowboy". He wrote that all three of those animated sitcoms treat Islam in the same way as they do new religious movements, interpreting them through widely held stereotypes, in this case terrorism. However, in his opinion, "MyPods and Boomsticks" is the one example in which Islam is hated at the start of the episode but not at the end. The Council on American–Islamic Relations praised the episode and sent a commending letter to Matt Groening. The Council's Executive Director Nihad Awad wrote that "Because of its acceptance in popular culture, comedy is often one of the best vehicles for challenging stereotypes and intolerance. Fox and Matt Groening are to be congratulated for tackling the disturbing phenomenon of Islamophobia." In April 2009, The Muslim Public Affairs Council gave an award to Shohreh Aghdashloo, the voice performer of Mina. The organization said that "The episode sends a powerful message through humor about the danger of ignorance and prejudice rooted in false assumptions". Wilmore's writing of the episode was nominated for Outstanding Writing in a Comedy Series at the 40th NAACP Image Awards. The award went to Erica D. Montolfo for the "White Coats and White Lies" episode of The Game. ^ a b "Listings — SIMPSONS, THE on FOX". 2008-11-08. Retrieved 2008-11-08. ^ a b c Pinsky, Mark I. (June 23, 2015). "'The Simpsons' guide to satirizing Islam". CNN. Retrieved August 16, 2018. ^ a b c d Aughey, Daniel (2008-12-01). "The Simpsons Episode Recap: "Mypods and Broomsticks"". TV Guide. Retrieved 2008-12-01. ^ "The Simpsons Apple spoof likely has many wondering what a "myCube" is". The Industry Standard. Archived from the original on 2008-12-22. ^ a b c d Canning, Robert (2008-12-01). "The Simpsons: "Mypods and Boomsticks" Review". IGN. Archived from the original on December 5, 2008. Retrieved 2008-12-01. ^ a b c d Bates, James W.; Gimple, Scott M.; McCann, Jesse L.; Richmond, Ray; Seghers, Christine, eds. (2010). Simpsons World The Ultimate Episode Guide: Seasons 1–20 (1st ed.). Harper Collins Publishers. pp. 972–973. ISBN 978-0-00-738815-8. ^ "November 30, 2008". TV Tango. Retrieved August 20, 2018. ^ Heisler, Steve (November 30, 2018). ""Mypods And Boomsticks"/"Straight As An Arrow"/"Phantom Telethon"". The A.V. Club. Retrieved 20 August 2018. ^ "Sound Bites: TV's funniest lines from November 28 to December 4". Entertainment Weekly. 2008-12-05. Retrieved 2008-12-07. ^ Feltmate, David (2017). Drawn to the Gods: Religion in The Simpsons, South Park and Family Guy. NYU Press. p. 210. ISBN 978-1-4798-9036-1. Retrieved August 20, 2018. ^ Tomaso, Bruce (2008-12-04). "'The Simpsons' commended for mocking Islamophopia". The Dallas Morning News. Retrieved 2008-12-06. ^ "CAIR Thanks Fox for 'Simpsons' Episode Challenging Islamophobia". Council on American-Islamic Relations. December 3, 2008. Retrieved August 20, 2018. ^ "Shohreh Aghdashloo to be Honored for 'Simpsons'". Muslim Public Affairs Council. March 26, 2009. Archived from the original on 2017-02-05. Retrieved August 16, 2018. ^ "40th NAACP Image Awards" (PDF). NAACP. January 7, 2009. Retrieved September 8, 2018. ^ Moody, Annemarie (February 13, 2018). "Dora the Explorer Honored with NAACP Image Award". Animation World Network. Retrieved September 8, 2018.